Bloody immigrants, coming over here and taking part in contemporary art group shows about the geopolitical relationship between Algeria, France and the UK! As if to highlight the inequalities of that relationship, graphic artist Zineddine Bessaï was this month refused a visa to attend the launch of his own show at Cornerhouse. 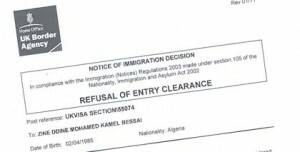 The Manchester gallery supported two applications: one for Bessaï (young, single, male, non-affluent) and one for Amina Menia (an older, better off family woman). It asked for permission for a four-night stay in the city as a business visitor and both letters are, apart from names, passport numbers and DoBs, identical. I’ve seen ‘em. But in one case the Home Office found fault with the supporting documentation and said the letter did not “describe in detail the nature of your business in the UK”. This would all be just sad and predictable and a not uncommon problem for artists from certain parts of the world and yet another problem for the arts in this country. Refused the chance to see his work in a prestigious international show, Bessaï has been invalidated further by skeptical quote marks round his stated vocation. My personal view is, whatever legal profession, people should be allowed to travel freely between countries. But keeping out artists is just as embarrassment. BTW – After spending more than 15 minutes waiting for their press office to pick up the phone, I concluded the Home Office were unavailable for comment. New Cartographies: Algeria-France-UK is at Cornerhouse, Manchester until 5 June 2011. See gallery website for proof.